inMotionNow is made up of a diverse group of inMotioneers with a wide range of skillsets, backgrounds, and personalities. But there’s one thing we all have in common: We genuinely love helping teams do more of the work they love. 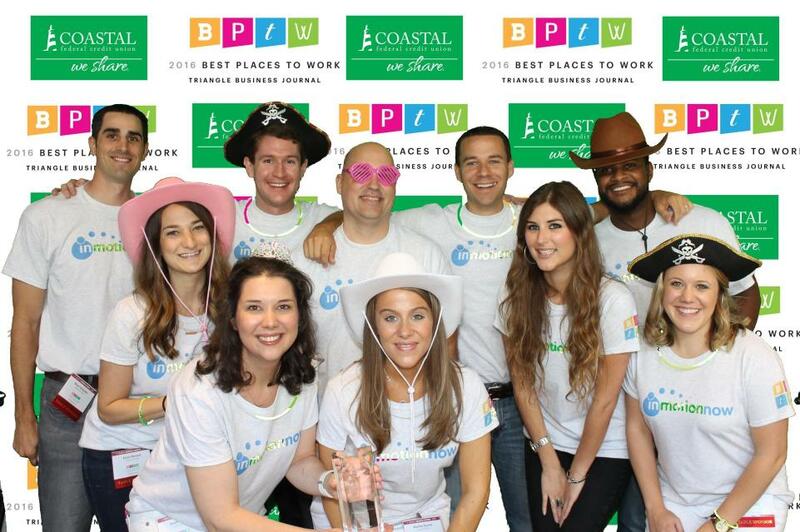 That unmistakable passion for what we do has cultivated a company culture that’s collaborative, empowering, and team-first—which are just a few of the reasons inMotionNow was recognized as a 2016 Best Place to Work by the Triangle Business Journal. Simply making this year’s list generated major excited, but last Thursday’s awards ceremony generated even more: inMotionNow was announced a top three Best Places to Work in the small organizations category—and the entire team celebrated inMotioneer-style. It’s that continuous commitment to fostering an amazing culture—even as the company has experienced tremendous growth over the past year—that made inMotionNow stand out as a remarkable organization amongst so many in the Triangle. CEO Ben Hartmere recently talked about w hat went in to the big win, citing momentum; empowerment; and a team of all-stars as some of the main drivers. Ben and the rest of the leadership team’s people-first mentality is one of the key reasons inMotioneers feel so passionate about continuing to grow the company. Check out our Careers page to see how you can join the award-winning team of inMotioneers.